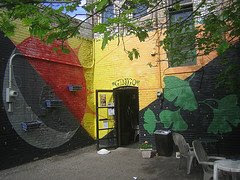 This mural was painted on the back of Ginkgo’s Coffeehouse in St. Paul. It adds to the atmosphere of their outdoor patio. The artist is unknown. This photo is part of 'Start Seeing Art' focusing on the Twin Cities of St. Paul and Minneapolis in Minnesota. Click here to see an enlargement and more photos of this mural. The artist is me! Connie Reynosa, I created this design while working under Mark Grunland with a youth arts team for Saint Paul Parks and Rec through Como Zoo. The mural was painted.July and.august the summer of 1999. It might have been 98, but I'm pretty sure it was 1999. I still have the original drawing in my sketchbook, and in fact the project was never completed, because if I recall we ran out of time.